Remember when the most important thing for building website traffic was getting incoming links to your pages? Guess what? It still is. The difference is that these days the emphasis is on quality. Only relevant, quality links count in the search engines, which is good news for business owners. You’re no longer competing with spammers who create phony sites strictly to serve as backlinks. Questionable practices such as buying and selling sketchy links are no longer effective. 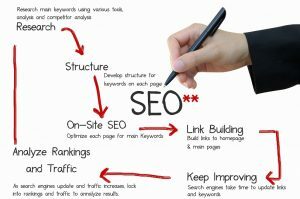 Now a site owner must develop quality links that will, in turn, raise the site’s ranking authority with the search engines. Today’s more nuanced search algorithms deliver more accurate results in response to users’ search terms. This helps everyone make the right connections of users to the products and services they seek and businesses to more qualified, prospective customers. First, let me explain what’s meant by ranking authority. Search engines organize results according to two main criteria: the relevance of the site to the search terms given by a user and the quality of the information on the site. This aspect of quality is measured by, among other attributes, the popularity of a particular site. One way to identify popular sites is by counting the number of links coming into that site from other sites. In addition to counting links, Google and other search engines calculate the quality of the site behind each link. For example, a site with an .edu extension indicates a university or school, which is assumed to contain reliable information and thus be of high quality. All of this information goes into a formula that determines the overall quality, or authority, of your site. The higher your site’s ranking authority, the higher your site appears in the search engine results pages (SERPs). In order to raise your site’s ranking authority, as well as the authority of the pages within your site, you need to secure incoming links from trusted, quality sites. While the search engines don’t divulge the actual formulas by which they calculate quality, we can make some informed guesses, such as with the .edu extensions mentioned above. Other likely high quality sites are those of recognizable, trusted brands and those operated by well-known institutions, news organizations and public figures, such as the Dallas Museum of Art, the LA Times and Oprah Winfrey. And there are hundreds, even thousands, of other good sites that are less well-known but can also increase your authority. So how do you find those quality sites and, more importantly, get them to link to yours? The simplest way is to provide a steady stream of great content on your site and then, request links to that content from related sites. Let’s say, for instance, that the site of a home builder offers a series of DIY fact sheets for homeowners. The webmaster could send a friendly email to area plumbers, electricians, supply shops, lumber yards and similar businesses calling attention to the fact sheets and suggesting that a link to that content might benefit their customers. This is a straightforward technique that often works well because it brings together several businesses that have similar target audiences yet don’t directly compete with one another. Another tactic is to write guest blogs for other sites and then include a link to your site in the bio blurb you’ll get as the post author. Similarly, you can post intelligent comments on the social media pages of well-known brands, promoting your relevant content and providing a link to it for downloading. If you’re thinking that this sounds time consuming, you’re right. Smart link building takes time, thought and the willingness to investigate lots of sites in order to find those that are truly relevant to your site and optimum to link with. However, the results you will get from proper link building is more than worth the effort. It can increase your site views in a relatively short period of time which means the potential for increased sales and that is what every business wants. Have you seen the benefits of Link Building on your site? Luckily for local SEO agents, most local businesses tend to have a very accidental method of acquiring links, and those that they have tend not to be from high DA referrers. Here’s a tip: say you have a local plumber as your client. Step 1: Find the top 5 plumbers from the SERP that also service their area. Step 2: see what backlinks they have. Step 3: Look for the links that provide authority and start building a list. Step 4: Now that you have a list of the strong links, start building links from those referring websites pointing back to your client’s website. Some are easy to do, some take time, some require a fee and some you may never get. The hardest part of this process is probably your backlink research. What backlinks do those competitors have? What makes a backlink “strong”?